First thing this morning I picked a plateful of picture perfect cherry tomatoes from the hanging baskets. I think these are about the last of them. Alex was off work and wanted me to teach him how to use the sewing machine. He made the drawstring bag project from the sewing classes I teach. I think he did great and I now have a sample bag to show the new students. 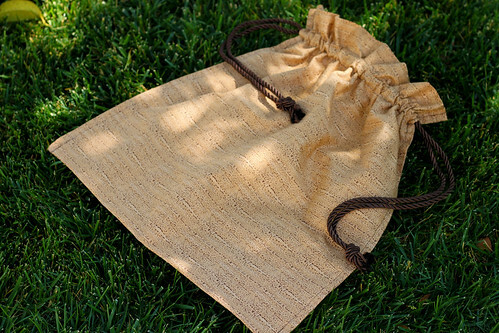 I might start using it as a project bag instead, I like it so much. It is a super easy 1 hour project for someone new to sewing using just a half yard of fabric and 2 1/2 yards of cording. This entry was posted on Tuesday, August 11th, 2009 at 3:00 am and is filed under Garden and Sewing. Tagged: Garden, Sewing. You can feed this entry. You can leave a response, or trackback from your own site. 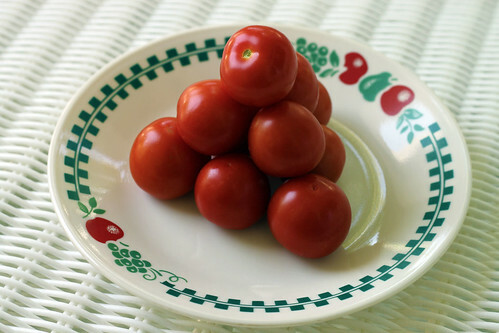 Real tomatoes–what a pretty picture! Yum! I need a tomato fix! Ours are still a long way off to be ripe…and your pincushion with the different stitches for reference is just downright clever…very cute idea!